Thanks to a specialized X-ray source at Lawrence Berkeley National Laboratory, researchers at the Georgia Institute of Technology have confirmed the existence of a long-hypothesized interaction between nitrogen and titanium dioxide (TiO2) - a common photoactive material also known as titania—in the presence of light. The catalytic reaction is believed to use carbon atoms found as contaminants on the titania. If the nitrogen-fixing reaction can be scaled up, it might one day help power clean farm-scale fertilizer production that could reduce dependence on capital-intensive centralized production facilities and costly distribution systems that drive up costs for farmers in isolated areas of the world. Most of the world's fertilizer is now made using ammonia produced by the Haber-Bosch process, which requires large amounts of natural gas. "In the United States, we have an excellent production and distribution system for fertilizer. However, many countries are not able to afford to build Haber-Bosch plants, and may not even have adequate transportation infrastructure to import fertilizers. For these regions, photocatalytic nitrogen fixation might be useful for on-demand fertilizer production," said Marta Hatzell, an assistant professor in Georgia Tech's Woodruff School of Mechanical Engineering. "Ultimately, this might be a low-cost process that could make fertilizer-based nutrients available to a broader array of farmers." Hatzell and collaborator Andrew Medford, an assistant professor in Georgia Tech's School of Chemical and Biomolecular Engineering, are working with scientists at the International Fertilizer Development Center (IFDC) to study the potential impacts of the reaction process. The research was reported October 29 in the Journal of the American Chemical Society. Medford, a theoretician, worked with graduate research assistant Benjamin Comer to model the chemical pathways that would be needed to fix nitrogen on titania to potentially create ammonia using additional reactions. The calculations suggested the proposed process was highly unlikely on pure titania, and the researchers failed to win a grant they had proposed to use to study the mysterious process. However, they were awarded experimental time on the Advanced Light Source at the U.S. Department of Energy's Lawrence Berkeley National Laboratory, which allowed them to finally test a key component of the hypothesis. What accounted for the initial lack of results? Hatzell and Medford believe that surface contamination with carbon—likely from a hydrocarbon—is a necessary part of the catalytic process for nitrogen reduction on the titania. 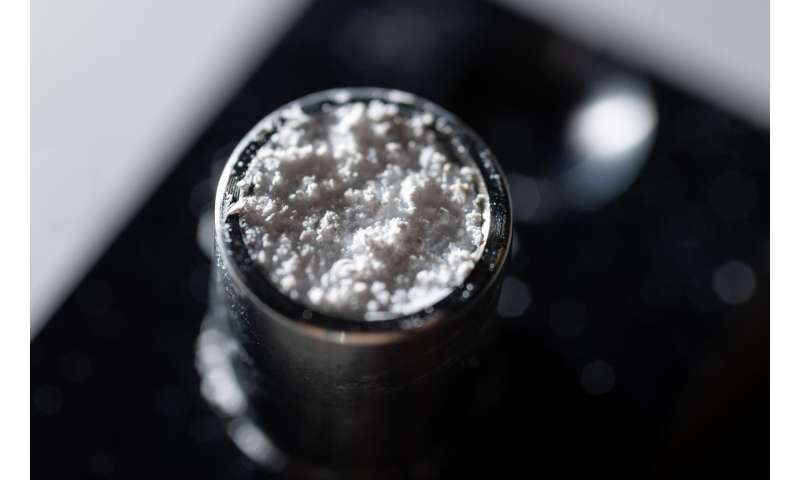 "Prior to testing, the samples are cleaned to remove nearly all the trace carbon from the surface, however during experiments carbon from various sources (gases and the vacuum chamber) can introduce trace amount of carbon back onto the sample," Hatzell explained. "What we observed was that reduced nitrogen species only were detected if there was a degree of carbon on the sample." "We think this explains the puzzling results that had been reported in the literature, and we hope it gives insights into how to engineer new catalysts using this 75-year-old mystery," Medford said. "Often the best catalysts are materials that are very pristine and made in a clean room. Here you have just the opposite—this reaction actually needs the impurities, which could be beneficial for sustainable applications in farming." The research reported in the journal did not measure ammonia, but Hatzell and her students have since detected it in lab scale tests. Because the ammonia is currently produced at such low levels, the researchers had to take precautions to avoid ammonia-based contamination. "Even tape used on equipment can create small quantities of ammonia that can affect the measurements," Medford added. "While this may sound ridiculous from a practical perspective at first, if you actually look at the needs of the problem and the fact that sunlight and nitrogen from the air are free, on a cost basis it starts to look more interesting," Medford said. "If you could operate a small-scale ammonia production facility with enough capacity for one farm, you have immediately made a difference." "Since earlier investigators looked at this, there have been significant advances made in the area of measurement and surface science," she said. 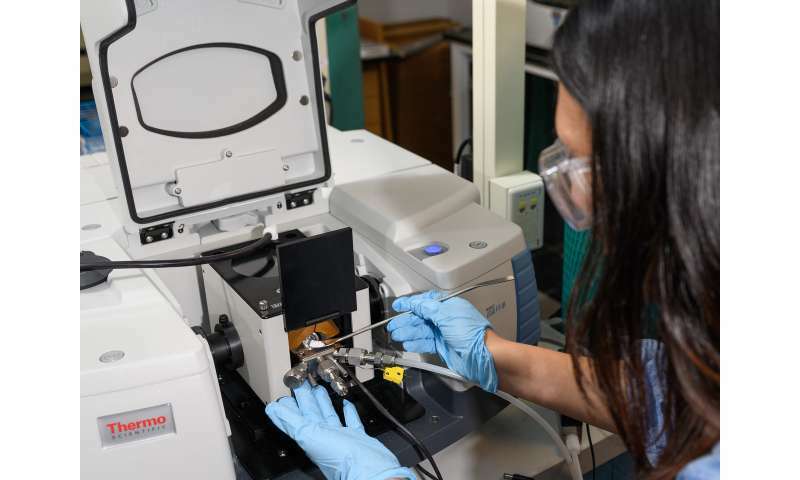 "Most surface science measurements require the use of ultra-high vacuum conditions which do not mimic the catalytic environment you aim to investigate. 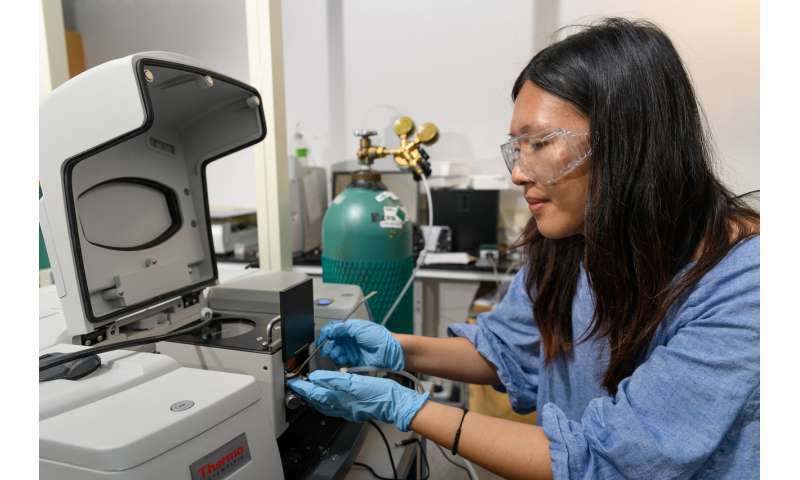 The near ambient pressure XPS at Lawrence Berkeley National lab, allowed us to take a step closer to observing this reaction in its native environment." ...for these regions which lack basic infrastructure and economic base, having such high-tech solution is equally implausible because it cannot be produced locally either. It has to be imported, thereby making the users just as dependent on the external source of materials and expertise, and thereby just as unable to negotiate the prices down. If it breaks, they can't fix it; if it gets stolen, they can't replace it. The idea is like a solar panel in a mud-hut village in the deepest of Africa - it only exists because someone from the outside gave it to them. Probably missionaries. "If you could operate a small-scale ammonia production facility with enough capacity for one farm, you have immediately made a difference." Yep, it's called keeping a cow and some chicken. One chicken produces about two cubic feet of manure every year, and it actually contains so much ammonia it will burn the plant roots if you toss it directly into the field. What you do instead, you take the manure, throw it in a compost pile with straw, and mix in wood ash and water - the compost pile will produce potassium and calcium nitrates, which are the very nitrogen fertilizers that you would be making out of the ammonia in a separate processing step. It's locally available, cheap as a byproduct of farming, and doesn't require energy or imported exotic materials. Unless by "difference", you're actually talking about setting an industrial scale farm in the middle of the jungle - not about helping poor subsistence farmers in third world conditions.